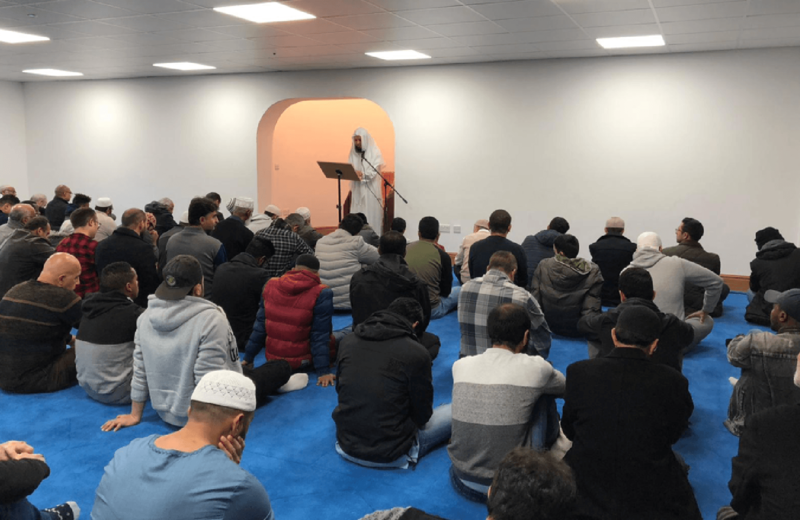 York Mosque has today (Friday 30 November 2018) joined Islamic Relief UK in its commitment to help end violence against women and girls by partaking in the “16 Days of Activism against Gender-Based Violence” which is an international campaign to challenge violence against women and girls. The campaign runs from 25 November, the International Day for the Elimination of Violence against Women, to 10 December, Human Rights Day. As the largest Islamic faith inspired humanitarian organisation in the UK, the organisation has launched the “Honour Her” campaign to fight all forms of violence against women and girls, including domestic abuse, sexual violence, human trafficking, forced and early child marriage, female genital mutilation (FGM/C), and so-called “honour” killings. York Mosque, which made headlines in 2013 for serving tea and biscuits to English Defence League supporters after the far-right group arranged a demonstration there, delivered a Khutbah (sermon) during Friday prayers to raise awareness of the issue and to help put a stop to the cycle of gender-based violence. The “16 Days of Activism against Gender-Based Violence” campaign has the support of key Mosques around the UK, including the Secretary General of the Muslim Council of Britain, Harun Khan, and the Chief Imam of the East London Mosque Imam Abdul Qayum. Islamic Relief UK is asking its supporters, Islamic faith leaders and the wider UK Muslim community to raise awareness, mobilise and take action on this issue through signing up to the “Honour Her” campaign pledge online. “As a British Muslim charity, Islamic Relief is committed to ending violence against women and girls worldwide as part of our core mission to save lives. Our “Honour Her” campaign was launched earlier this year to encourage debate on this important matter and to help inspire action in communities across the world. We are especially promoting the campaign in November and December as part of the global movement for 16 days of activism on violence against women and girls. “We are incredibly grateful for the support of mosques across the country. We know that religious leaders, civil society, faith institutions and men as well as women are essential to drive real change and we welcome their involvement in tackling this issue. It must also be recognised that this is not a Muslim problem but a cultural and societal issue. If there is one message here today; it is this: violence against women and girls, in any shape or form, is not acceptable”. Both here in the UK and worldwide, Islamic Relief UK is working to promote community dialogue, financially and socially empower women and put a stop to the cycle of gender-based violence. The campaign represents a global effort across the Islamic Relief family to tackle Gender Based Violence (GBV). Islamic Relief UK is calling on the support of Muslim faith leaders throughout the country to help spread this important message. They can do so through by pledging to support the campaign and speaking about it in the next Khutbah. At a major UN conference on women’s rights in March, representatives of Islamic Relief Worldwide publically called on Muslim faith leaders, governments, institutions and civil society actors to commit to establishing gender justice globally. The organisation also published a series of policy papers on the issue of VAWG within humanitarian settings including Early and Forced Marriage and FGM/C. To support the campaign, please go to http://iruk.co/honourher where supporters can access and share the pledge, video and more information. Violence against women, particularly intimate partner violence and sexual violence, is a major public health problem and violation of women’s human rights. An estimated 100m to 140m women and girls currently live with the consequences of FGM and more than 700m women alive today were married below the age of 18, with one in three of those married before the age of 15. Islamic Relief Worldwide is an international aid and development charity that aims to alleviate the suffering of the world’s poorest people in more than 30 countries, mainly in Africa, Asia and the Middle East. As well as responding to disasters and emergencies, Islamic Relief promotes sustainable economic and social development by working with local communities – regardless of race, religion or gender. Islamic Relief UK is a strategic unit of Islamic Relief Worldwide and represents the charity in Great Britain and Northern Ireland. The World Health Organisation (WHO) estimates that globally one in three women have or will experience violence in their lifetime, and that women and girls are disproportionately affected by Gender-Based Violence (GBV).